Business owners will appreciate the generous earning scheme of this no-annual-fee World Elite credit card, as well as the simplicity of earning and redeeming cash back. The U.S. Bank Business Cash Rewards World Elite MasterCard offers a great earning scheme: You get 3 percent cash back in three popular categories and an annual bonus of 25 percent of the previous year’s cash rewards. In addition, getting your cash back is easy. You can deposit it into your U.S. Bank account or apply it toward a statement credit. The Business Cash Rewards card offers a $200 cash back for spending $1,000 in the first 90 days. This isn’t the most generous bonus that you can find on a cash back business rewards card (for that you should check out the Capital One Spark Cash card or the Chase Ink Business Cash card), but at least the threshold for the bonus is low and you don’t have to pay an annual fee in the process of earning it. You get unlimited 3 percent cash back for gas, cellphone and office supply purchases. In addition, you get a 25 percent bonus on the previous year’s cash back up to $250. You might think of this as a delayed sign-up bonus. The U.S. Bank Business Cash Rewards World Elite MasterCard offers 0 percent APR on purchases and balance transfers for the first 9 billing cycles, followed by a 14.24 percent to 25.24 percent variable APR after that. While this interest rate is lower than average, you can find a better APR if you intend to carry the balance. You can redeem your cash back in $25 thresholds by depositing it into your U.S. Bank business account, applying it toward a statement credit or receiving a prepaid Visa card. The rewards earned from your employee cards will usually be automatically pooled to your central bill account. The U.S. Bank Business Cash Rewards World Elite MasterCard offers a suite of business tools to help you easily manage your account. You get FlexControl budgeting tools that allow you to automate your payments; ScoreBoard online reporting to track and monitor your expenses; and the innovative mobile app that lets you send or request money, and deposit and pay checks using the U.S. Bank PhotoBanking feature. Getting World Elite MasterCard benefits with no annual fee is an excellent perk of its own. Some of the perks are very enticing, such as exclusive offers through the Priceless Cities program, MasterAssist Travel Assistance Services, upgrades and special deals at luxury hotels and resorts, and many others. Why get the Business Cash Rewards World Elite MasterCard? 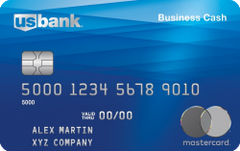 You’re looking for a business credit card with a high earning rewards program. You prefer a rewards program that is simple in earnings and redemption. You want a card that allows you to have multiple employee cards with no fee. You want a card with a low APR and 0 percent introductory APR that you can use for cash flow. Maximize your 3 percent cash back by using the card for gas, cellphone and office supply purchases. Try to earn at least $1,000 in cash back annually to take the full advantage of the 25 percent cash back bonus. Avoid using the U.S. Bank Business Cash Rewards World Elite MasterCard abroad, since it adds a 2 to 3 percent foreign-transaction fee. Spend at least $1,000 in the first 90 days to earn the sign-up bonus.